This year’s event runs through Tuesday, August 8, 2017 at 11:59PM PDT. 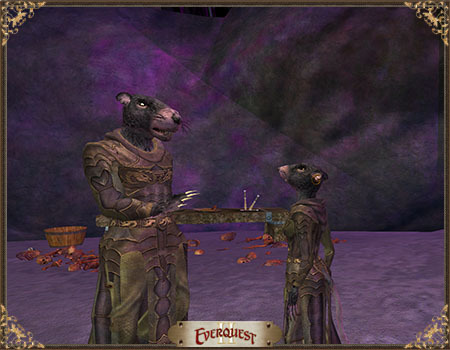 You’ll find new limited time Public Quests throughout Norrath. Just check your map for these unique battle regions! Damage inflicted against public quest encounters scales to allow public quest fights to be relevant for players of all gear levels. New Fabled content to explore from The Fallen Dynasty! These new Fabled dungeons can be accessed through a portal just off the docks in The Village of Shin. Good luck! The Orcish Wastes have been invaded! The Green Hood and Deathfist clan have been routed by a new breed of orc, The Scourge, who are preparing their armies to advance beyond the wastes. They must be stopped, or Norrath will be ruled by the tyrants of The Hounds of War! Signature Quests – Special quests for max level Adventure players! Check your mail for how to get started! Level Agnostic Shard of Love – Version of Shard of Love: Moment in Valor dungeon that scales for players 20-100! Heartbound: Become heartbound to that special someone to gain a nifty new title and bonuses for playing together! New stat “Resolve” which NPCs and players alike can raise. Matching your opponent’s resolve will keep you from incurring added damage from the adversary and make it easier to keep your outgoing damage at its full potential. All Terrors of Thalumbra items have gained the resolve stat to help get you started! This update is heading to test later tonight, ETA ~10pm PST. GU 100 is now available on Test server. Level 100 players should expect to receive an in game mail directing them further. 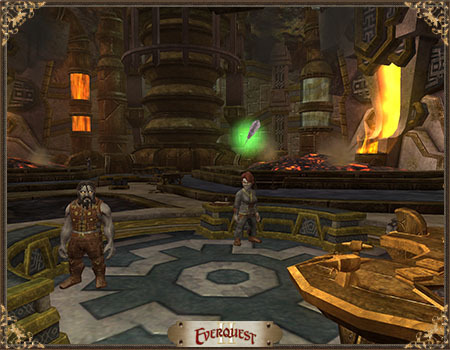 Removed the embedded Legends of Norrath (LoN) client from the EverQuest II client. If you wish to continue playing LoN, please download and use the standalone client available at www.legendsofnorrath.com. Characters on Thurgadin have been granted legacy server titles. Fixed a bug where it would take a long time for your Daybreak Cash balance to show in the marketplace window. Fixed a bug where players could lock other players out of Kralet Penumbra. Made adjustments to most NPCs to make lower level encounters less punishing. Fixed an issue where actors being killed could set the zone lockout in persistent dungeons. Servitor of Yothshaval’s spell “In Service of the Master” damage has been reduced, but a power drain component added. Updated an encounter of Aberrants within the Tepid Depths to be of the appropriate agnostic challenge. Increased the time before a mercenary auto suspends. Summoned Pets will now back off after a period of inactivity from their summoner. Ykeshan frogloks near Guk in Moors of Ykesha now drop their love notes at the same rate as other mobs. 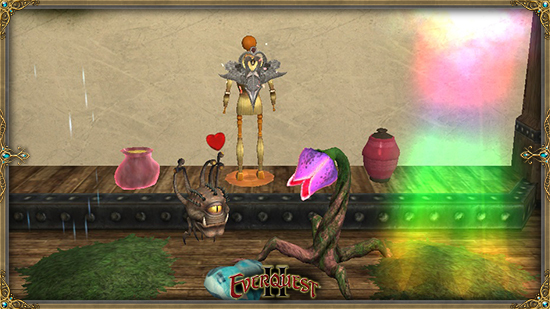 An Oval Heart-Stained Window Pane has been added to the “[eq2u]Romantic Gifts to Craft IX[/eq2u]” recipe book. Fixed an issue where marketplace Burbur house items could not be sold for status. Adjusted the crit chance granted by many weapons between level 1 and level 90 to fit within progression. 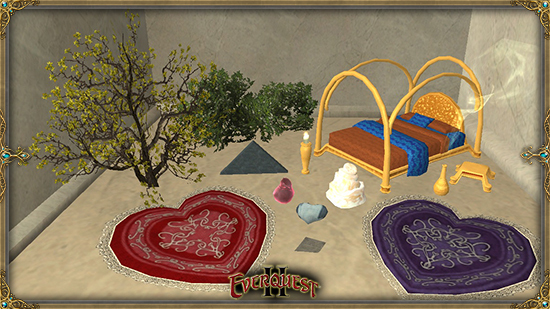 Love is in the air, fair Norrath, and with good reason – it’s time for Erollisi Day! And this year, our hearts are bursting because we’ve got NINE new achievements, two new quests, and a new tradeskill book full of delightful new things to craft! From Thursday, February 4th through 11:59PM PST on Wednesday, February 17th, you can experience the fun and frivolity of the Erollisi Day holiday! Enjoy your favorite returning quests (how IS your romantic reputation doing?) and try your hand at the new quests for handsome rewards. And keep racking up those achievements! Who will help the Doomed Lovers if not you, dear hero? There is an issue, we’ll have it fixed ASAP. This wasn’t intended at all. Its been a total mess. We apologize. We have again upgraded the final reward and hopefully it will be worth everyone’s time and frustration. Looks like this fix will be February 2nd. We’re having some internal conflicts and wont be able to patch until then. Thanks for being patient everyone. Charmed creatures in agnostic zones will no longer be supercharged. Corpse Candles can no longer be charmed. Bone Crushing Swings and Pressure of the Deep no longer effect Dissonance of Savagery. Mercenaries will now suspend after a period of player inactivity. Mercenaries no longer have any initial hiring fees. Stormhold & Deathtoll – Approx downtime three hours for Kingdom of Sky content prep. We’re estimating that these servers will open at 10AM PST. Tonight is the last night of Frostfell until later this year, while tomorrow sees the unlocking of Kingdom of Sky on the Time-Locked Expansion servers. Meanwhile on live servers, in addition to a number of content fixes, we will also see a potentially significant change to AAs. Abilities that used to grant Crit Bonus will now grant Potency instead. Finally we must say goodbye to a feature that has worked inconsistently at best for many years but must have proven too difficult to fix. With tomorrow’s update, the PvP Arena feature will be disabled in EverQuest II, with the rewards from that content, including unique house pets, being moved to the Loyalty merchant. All encounters received a global balance update that can be adjusted dynamically by development. Level 20+ encounters now mitigate damage based on level and tier. All blue stats have been unlocked with the exception of crit bonus. The respawn point for Bereth’s Overlook should no longer be an available option for reviving unless Bereth has been defeated. Priest can now cure themselves of Dalkuhm’s “Borrow Weapons” debuff. The Psionists will now correctly react to those who attempt to drain their well of power. Wrist of the Great Forge is now correctly named Ring of the Great Forge. Ethereal Onslaught will now correctly reset Sniper Squad. Primordial Burnout will now trigger on combat arts and spells. Kiss of Life will now heal for the correct amounts. “Malduran Mouths to Feed” should now update correctly for moussaka and bibimbap. Recipes from the Dhalgar Home Builder’s Kit recipe book are now flagged as building blocks for the purpose of house item count. Enemies in the Ever Deep will now award a random infuser or damaged spiritstone. The Event Heroic weekly mission, “Trail of Deceit and Death,” can now be completed. A Far Seas Trading Company representative has arrived in Maldura and will now sell Age of Malice blank runes in exchange for Coin of the Grand Artificer (they are still also available for far seas tokens from the original sources). She can be found in the Mushroom Bar and Grill. The electro-charged battery is now automatically placed in your inventory, when appropriate, during the encounter with X-O Arachmech. Urzzra-Uzulu’s Thought Graze now drains more power. Urzzra-Uzulu’s Thought Overload is now limited to 20 meters. Fixed a bug that caused Urzzra-Uzulu to keep its stoneskin active throughout the encounter. So what’s new in the expansion? How do I get started with the new expansion content? What do I get for completing ALL the quests in the expansion not just the Signature line? What is there to know about Tradeskills in the expansion? What’s up with the new Harvesting materials/rares? Help! There was some really important information on the Terrors of Thalumbra beta forums but they’ve disappeared! What itemization changes have there been in the ToT expansion? What are RELIC and PRESTIGE items? What’s up with Weapon Delays this expansion? What is the new Deity window in Terrors of Thalumbra? Are there any new Deities we can worship? Can you really spend 500,000 Platinum to Infuse one character’s items? Are there any new Adornments in Terrors of Thalumbra? Is there a Contested Heroic Zone? What’s the best way to level? How do I get to Terrors of Thalumbra Zones? Is there a labeled Zone Map for Thalumbra? Is it true that Quest Regions of Interest no longer marked on the map? Which UI Modifications are still compatible with Terrors of Thalumbra? Where can I download a high resolution version of the Terrors of Thalumbra poster art? 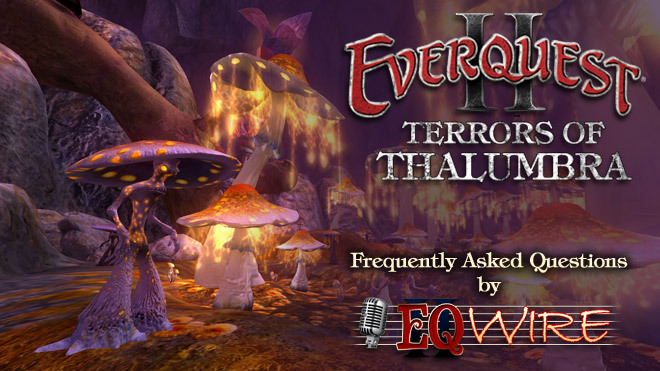 Tomorrow is the launch of Terrors of Thalumbra, EverQuest II’s twelfth expansion! All EverQuest II Live Servers will be brought offline on Tuesday, November 17, 2015 at 7:00AM PST* for the Terrors of Thalumbra expansion update. Estimated downtime is approximately five hours. 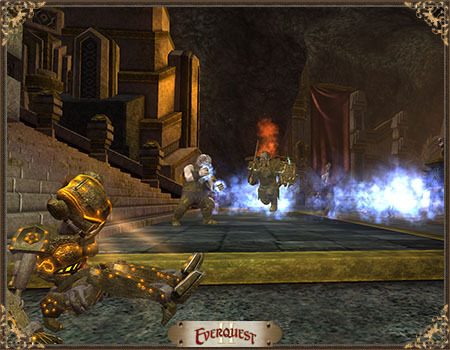 EverQuest II: Terrors of Thalumbra is scheduled to unlock to players at noon pacific** on Tuesday, November 17, 2015. Deep underneath Norrath lies a realm on the edge of the Plane of the Underfoot, known as Thalumbra. 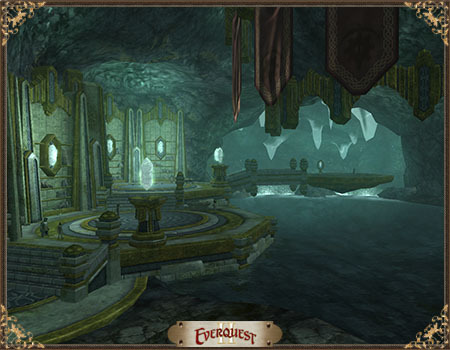 This expansive, subterranean domain is home to fabled races and ancient terrors! When the dark shroud upon this land is pierced by Lanys T’Vyl, the recently resurrected demigoddess of Malice, it spells doom for all! You are a hero on the stage of Norrath. Will you play your part and protect Norrath from those who seek to destroy it? What mysteries will your torch uncover deep beneath the surface? Can you withstand the terrors of Thalumbra? Delving into the depths of Norrath has awoken a deeper connection between the gods and the physical realm, allowing them to channel power more directly through their chosen instruments in the form of powerful new miracles. As you gain adventuring experience you will also gain tithe experience, and tithe points. Tithe points can be spent in one of two ways, the first is to purchase charges of these new miracles. You can only have a certain amount of tithe points banked or spent on miracles at any particular time. While you can purchase any abilities that match your city alignment as well as neutral abilities, the ability from your chosen deity from completing the existing deity quest lines grant will be at a discount. For example, if your deity is Tunare you would be able to purchase the Lifeshield ability at a discount. This will allow you to use the ability more often as well as to hold more miracles as it reduces the amount of tithe points spent on that ability. You do not have to have completed any deity quests to make use of deity abilities. The City of Maldura is an ancient dwarven outpost that predates even Kaladim. Over the centuries it has grown into an imposing citadel whose fortifications have repelled many assaults from the outside. However, in more recent years a threat that is neither living nor undead has begun to emerge in the deep sublevels. Relentless, furious, and almost unstoppable, the immolated have no mercy and cannot be controlled by any known type of magic. The worried residents of Maldura have been forced to seal off entire areas of the city to contain this threat, abandoning research laboratories and productive mines as they fled. Under attack from the aberrants outside and the immolated inside, the citizens of Maldura have been preparing for the worst. But their last, desperate attempt to send a message to the surface lands succeeded; and now a wave of fresh adventurers from the Shattered Lands is making their way to Maldura. Will you be able to help save the city? In the Terrors of Thalumbra expansion, crafters who have reached tradeskill level 100 will receive a letter from Captain Ethan of the Far Seas Trading Company. 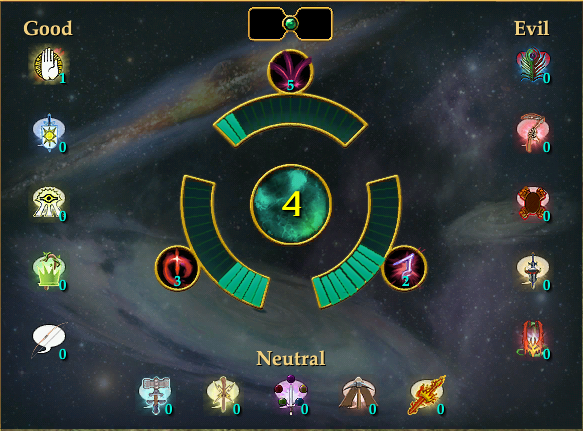 You’ve assisted him in the past, and he’d like your assistance once again as the FSTC investigates reports of strange elemental attacks that have been occurring all around Norrath. Where did these elementals come from, and why do they appear to have mechanical parts inside them, made of a type of ore you’ve never seen? Your investigation will bring you in contact with old friends and new, as you gather information and piece together a trail of clues that will lead you, if you are clever and diligent, to the mysterious new realm of Thalumbra. Once in this new region, you’ll need to earn the trust of the local residents, evaluate the situation and the dangers, and learn who you can trust… and who they can’t. Crafters of all adventure levels will uncover the dark secrets in the city of Maldura, work with the locals to try and find solutions, and maybe even find a way that crafting might help to save the city. This expansion brings least 20 new tradeskill quests, plus a tradeskill signature quest and an additional 8 repeatable weekly missions, plus new tradeskill collection quests, and more. Tradeskill quests can be completed at any adventure level, but those who are also level 100 in adventuring will additionally be able to use a new Relic type item with significantly useful benefits in combat. The ‘Restore Items’ tab on the character window is now available. Tserrina should once again cast her Malicious Shadows and Malicious Strife spells. Ritual Keeper V’derin should more reliably cast his Rain of Malice ability. Once spawned, avatars should now respawn if they sense they have not been defeated and reset for any reason. Teleporters to avatar islands no longer deactivate when an avatar is engaged. Flash Cast no longer references Empower Servant, as summoner pets no longer consume power when using abilities. Enhance: Marisha Kur’s Blessing will now correctly enhance Marisha Kur’s Blessing. Players can no longer flurry in PvP combat. Players will now require more spell resists to reach the resistance cap in PvP combat. Ensured all timed writs in the level 40 range for all crafting classes have no less than 3 parts and therefore will receive fuel cost reimbursement in 3 parts. Insulated Warmers – The root of the World Tree has begun providing sap, once again. Fixed a display issue where starting equipment was not showing correctly during character create. Fixed an issue where some nameplates would show incorrect names. Fixed an issue where the house item edit mode wheel was not responding. PvP kills will now reduce faction with city guards. Guards in city zones will now assist citizens in PvP if that citizen is attacked while in proximity of the guard. Guards in City Zones will now come to players’ aid in PvP combat more often. If a guard, in a city zone, AKA carnage flag zone, witnesses any hostile act against a player of his or her city faction they will assist that player. NOTE: Guards in non-city zones such as Antonica and Commonlands are not affected. Only in city zones like Halas and Darklight Woods. Fixed a bug where all of your tradeskill abilities would be greyed out when you start tradeskilling.